Sundried & Fresh Tomato Cream. | Eat More Plants. Sundried & Fresh Tomato Cream. This cashew cream is great on so many levels: as a dip, with pasta, raw noodles or as a stuffing. Today I used it to stuff zucchini, rollatini style. Of course, looking for another way to use my abundance of zucchini! This is equally tasty raw or cooked. Blend cashews, both tomatoes, garlic, olive oil, vinegar and a pinch of salt in a high powered blender until totally smooth. Taste and season more if necessary. Using a mandolin on the thinnest setting, slice your zucchini lengthwise. I used at least three slices for each roll, layered on top of each other to create a sturdy base. Even if your strips don’t come out even, once you lay them flat and roll them up they should be fine. Place 2 or 3 tablespoons of dip at the beginning of your zucchini. Sprinkle 1/2 a tablespoon of the chopped walnuts or pignolis on the filling and roll, not too tightly so your dip squeezes out of the ends but tight enough so that there’s no air pockets inside. Spear each roll with a toothpick to hold it together and place side by side in a glass baking dish, greased lightly with oil. When you have rolled as many as you like, rub a little oil on top to prevent drying out and/or burning. Bake at 425 for 10 minutes, remove your dish and sprinkle on bread crumbs, a pinch of dried oregano, salt and fresh cracked pepper. Place your rolls under the broiler for 3-4 minutes, keeping an eye on them so the bread crumbs don’t burn. 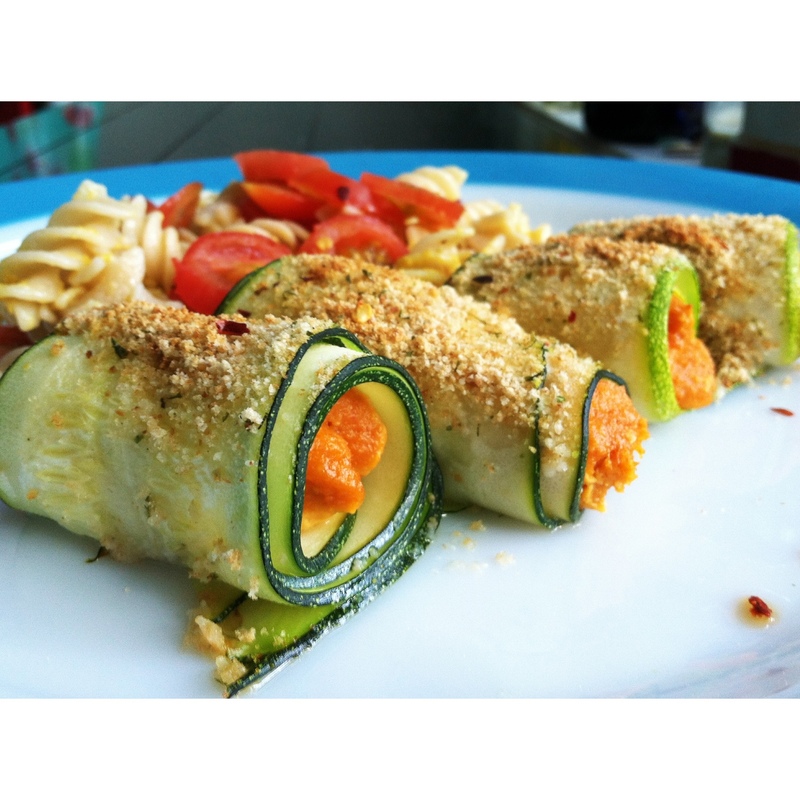 I served these with rice pasta, fresh sliced tomatoes and a sprinkling of nutritional yeast. Just bookmarked and pinned this. It looks fantastic! Thanks Jen!! The tomato dip on its own is one of my favorites. So, so, so good!